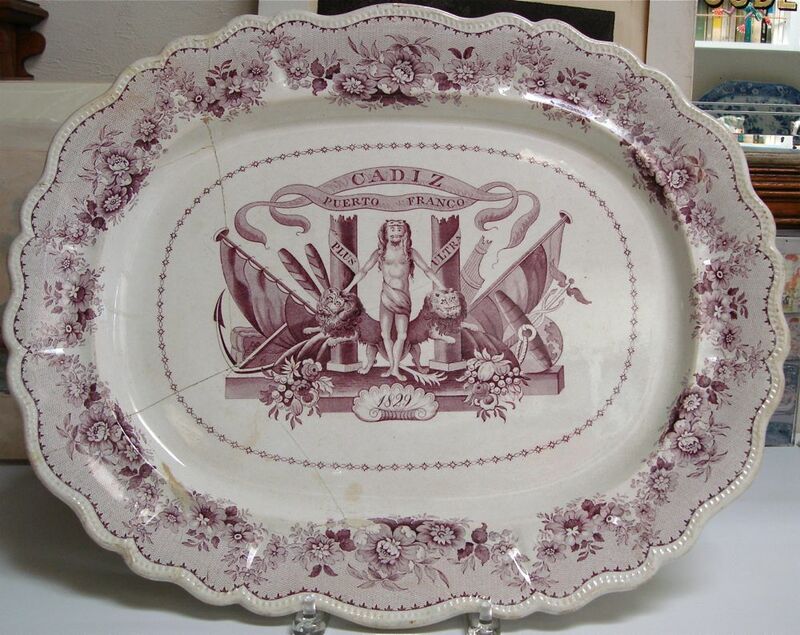 I purchased a damaged 1830s purple transferware platter with a cartoon-like pattern that looked like it would be interesting to research. 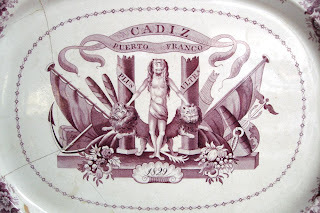 The words "Cadiz Puerto Franco" and the date "1829" helped me to find some information on what appears to be a rather obscure piece of European history (at least to me). Of course, that is no surprise since my knowledge of European history is a bit sketchy. 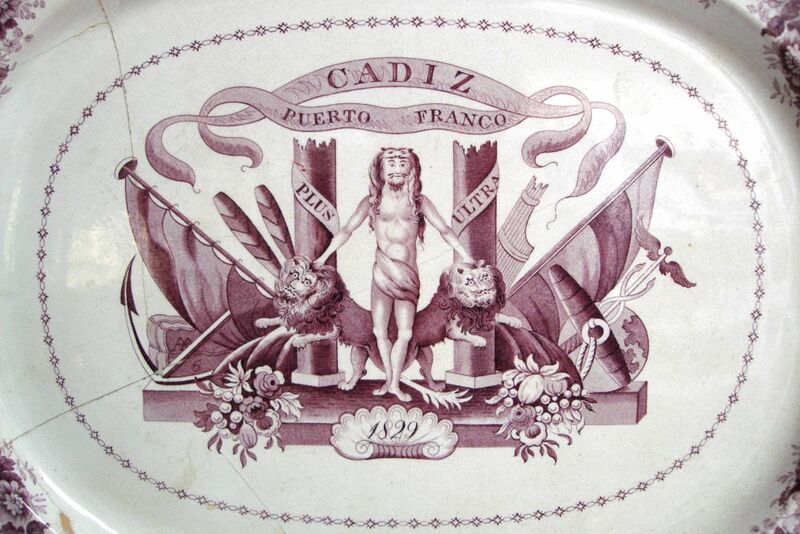 The design commemorates the creation of the Puerto Franco de Cadiz or Free Port of Cadiz by decree of the Spanish King in 1829. The man has his hands on two lions, always symbols of power. He is wearing what appears to be a lion's mane and ears! Nautical symbols of an anchor and sails on the left mix with the caduceus on the right, which is the symbol of commerce. I read that the caduceus is often mistakenly used as a symbol of medicine, especially in North America, due to historical confusion with the traditional medical symbol of the rod of Asclepius. The Rod of Asclepius has only a single snake and no wings. It is probable that the pattern was made as a special order for the Free Port of Cadiz. 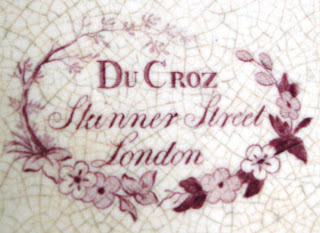 Both James & Ralph Clews and John & William Ridgway used the border and inner stringing seen above on their Tuscan Rose pattern, so it is not clear as to the maker. 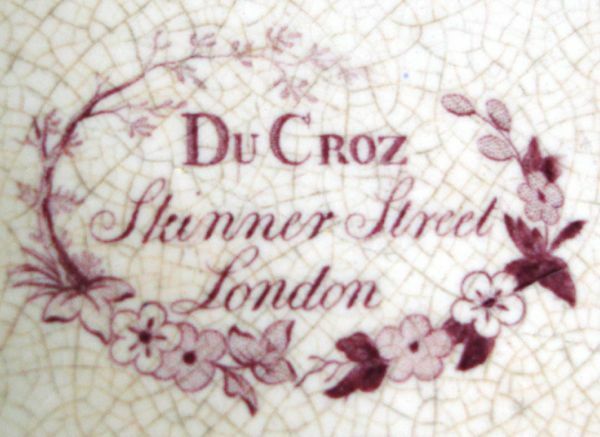 However, John Du Croz was a retailer/wholesaler in London in the early 1800s and was at Skinner Street from 1811-1837. The shape and the color of the platter, as well as the subject matter, date it to the early 1830s.